I have a 3.5 TFT and I used these instructions to get it to work with RetroPie on my Pi Zero W.
The reason this is important is although there are schematics for this LCD panel, I'm not using any of the touch features in RetroPie. 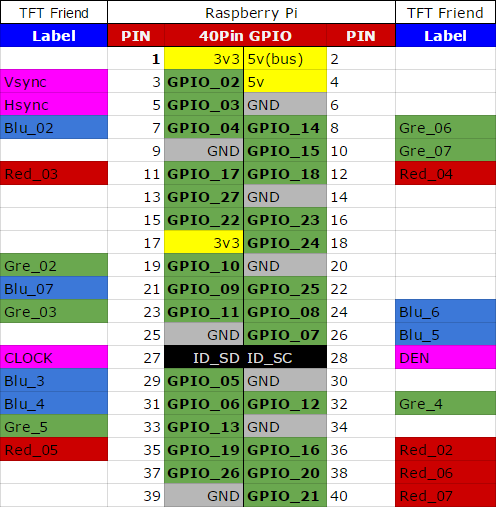 Therefore, I am also suspicious that I'm not using all the same GPIO pins that you see listed here. The thing is I need to use pin 18 for output to a mini metal speaker so was curious if anyone can tell me based on the above infomation, what pins does this panel actually use? As you can see pin 18 is used by the display for Instruction/Data Register selection. So, unfortunately you are not going to be able to use that pin for anything else. However there are other pins free so theoretically you could make something work. Just be careful about not pulling too much power from the Pi. Also looking at the datasheet I suspect only pins 11, 19 and 21 are being used by the display. I'm fairly certain pin 18 is required. If you don't need the functionality of a touchscreen, a display that connects to the DSI port might be more suitable and should leave pin 18 free. Not the answer you're looking for? Browse other questions tagged gpio pi-zero-w or ask your own question. GPIO pins stay on unless being used by a program? Why are my fps so low with pi zero w vs pi 3?